Jhelum and Tawi Flood Recovery Project (JTFRP) Jobs Recruitment. 2018 -19 : JTFRP recently published the official jobs notification for vaious posts of Environmental Expert, Assistant Environmental Expert, Social Expert, MIS Specialist jobs . Jhelum and Tawl Flood Recovery Project (JTFRP) funded by World Bank Invites applications from the permanent residents of J&K State for following posts (On Contractual Basis upto June 2020) to be stationed at Jammu/ Srinagar. All the interested candidates can apply for the various vacant positions in the JTFRP. The JTFRP published vacancies for jobs aspirants of J&K. Interested Candidates must possess at least Post Graduate or any higher/ equivalent qualification pass from an institute recognized by the State Government to apply for the same post. All the interested and Eligible candidates can apply on the application form along with self attested copies of Qualifications/experience certificates and self addressed envelope shall reach the office of Project Management Unit, Jhelum &Tawi Flood Recovery Project (JTFRP), Hotel Rachna, Old Gagribal Road, Opposite Nehru Park by or before 28-08-2018 Jkalerts will provide you the complete detail about this J&K Govt job notification like Eligibility criteria, How to apply Online, Important dates, Age limit with relaxation, post by category, Selection process & official notification. So interested candidates are requested to read it carefully to apply JTFRP jobs. Qualification Full time Masters in Environmental Science from a recognized university 5 years of experience in preparation, implementation and monitoring of environmental impact assessment, EMP and in handling environmental issues regarding restoration and reconstruction projects. Previous professional work experience in the state and work in the World Bank. ADB Multi-Lateral Funding Agencies assisted projects shall be considered favourably. Qualification Full time Masters in Environmental Science from a recognized university. 3 years of experience in preparation, implementation and monitoring of environmental impact assessment, EMP and in handling environmental issues regarding restoration and reconstruction projects. Previous professional work experience in the State and work in the World Bank. A06 Multi-Lateral Funding Agencies assisted projects shall be considered favourably. Minimum 5 years of experience in community development, community mobilization, resettlement, disaster management, gender and rural development. Conversant with the participatory tools such as PRA, micro-planning, participative monitoring and evaluation in community development, public building and Watson and rehabilitation activities. The candidate should be well versed with the socio-economic conditions of beneficiaries and should be able to communicate in the local language. Previous professional work experience in the state and work in the World Bank. ADB multi lateral funding agencies assisted projects shall be considered favourably. Fluency in both oral and written English, Urdu and Hindi. 1. The appointments shall be purely on contract for a period upto June 2020 only. The suitability of the candidates shall be reviewed at the end of 01 year and extension shall be granted on satisfaction of JTFRP. 2. The services of successful candidates’ can be terminated by JTFRP by giving 01 month notice or with remittance of one month’s salary in lieu thereof. If candidate wishes to leave the services of JTFRP He/ she shall have to give three months notice or remittance of three months’salary n lieu thereof. 3. 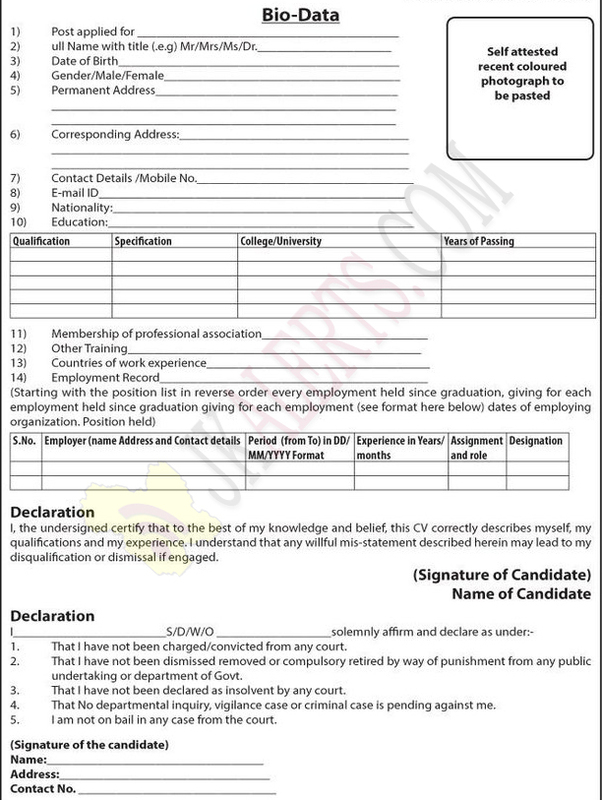 Candidates shall have to submit a self declaration that he has not been charged/convicted by any Hon’ble Court nor dismissed/removed/compulsory retired by way of punishment from the service of any Public/ Private Sector undertaking or from Government Departments and that he has not been declared involved in any unlawful activity by any court. The application form along with self attested copies of Qualifications/experience certificates and self addressed envelope shall reach the office of Project Management Unit, Jhelum &Tawi Flood Recovery Project (JTFRP), Hotel Rachna, Old Gagribal Road, Opposite Nehru Park by or before 28-08-2018. No application will be entertained thereafter. Only shortlisted candidates will be called for interviews on a date that will be notified separately. Last date to apply 28-08-2018. The shortlisted candidates will be invited for interview in the ratio of 1:5. No T.A./D.A. will be admissible for attending the interview. The candidates who had already submitted applications earlier in response to the notice issued by the JTFRP shall be considered for selection and if they want to submit fresh application in light of any new qualification/experience, they may do so within the stipulated due date.